Audi is facing a raft of competition in one of the market’s fastest-growing segments, so it’s no surprise it has decided to give the Q3 an upgrade, rather than just a facelift. The carmaker is also offering a variety of different trim levels that let buyers choose something that’s more sporty or, if they prefer, a bit more elegant. The heart of the 2019 Audi Q3 is its new 2.0-liter turbo-four. It pumps out 228 horsepower and 258 pound-feet of torque, an increase of 28 hp and 51 lb-ft over the outgoing crossover. Power is channeled into an eight-speed Tiptronic automatic and then directed to all four wheels, Quattro now standard on all Q3 trim levels. The engine can launch the Q3 from 0 to 60 in 7.0 seconds, according to the automaker. All Q3 models, meanwhile, offer drivers five selectable modes, including comfort, auto, dynamic, offroad, and individual, the latter allowing a motorist to set specific vehicle settings to personal choice. The new Q3 has grown 3.8 inches longer, 1.5 inches taller and nearly an inch taller than its predecessor. The extra space translates into a roomier cabin and cargo compartment. Visually, the new Q3 won’t deliver any real surprises, though it’s more than just a rehash of the old CUV. 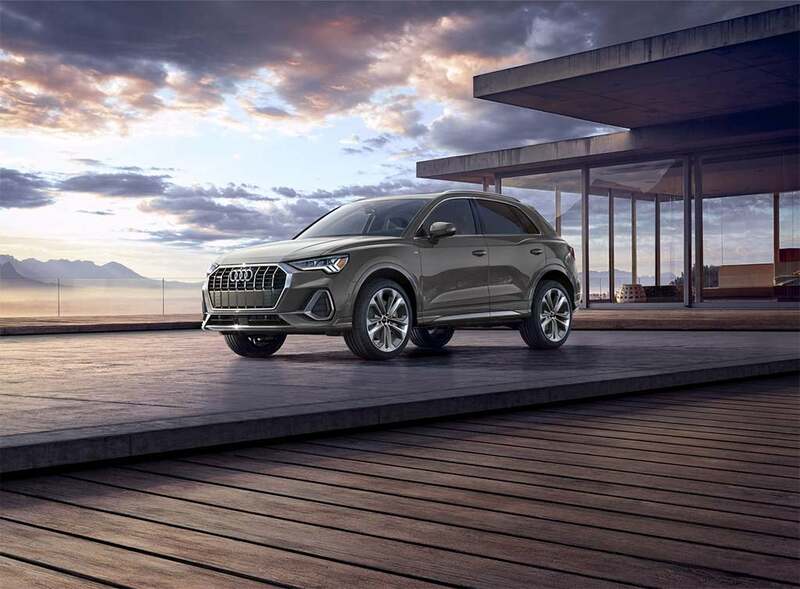 The Audi Singleframe grille now adopts an octagonal shape with vertical chrome slats meant to emphasize the height and width of the crossover’s front end. The grille is framed by new headlights that flow into the Q3’s shoulders. In back, there are new, standard LED taillamps that echo the layout of the Q3’s nose. As for the cabin, the new layout was “built to showcase an evolution in Audi digital precision and seamlessly integrate more useable technology,” the automaker said in a news release announcing the NY preview. The base gauge cluster is now a 10.25-inch digital display, with an available 12.3-inch upgrade. The infotainment system and other vehicle systems can be controlled by an 8.8-inch touchscreen – which can be upgraded to 10.1 inches. Motorists also have the option of using steering wheel controls, handwriting recognition or a new voice control system that can be operated with more natural commands. The system provides audio feedback when the touchscreen is used and also can respond to verbal questions, much like the Google Home and Amazon Alexa voice assistants. For $35,000 – plus $695 delivery fees – a buyer gets the base “Q3 Premium.” For $38,795 plus delivery fees, the Premium Plus package adds a variety of standard features. Among the other packages, the S Line Prestige, at $43,895 plus delivery adds niceties such as sportier bumpers, unique side sills and 19-inch alloy wheels. Automatic emergency braking is standard, as are a number of other advanced driver assistance systems, and the Q3 also can be outfitted with a top-view camera system and auto park assist, among other features. The 2019 Audi Q3 should start rolling into U.S. showrooms in the coming weeks and will target competitors like the new Volvo XC40, BMW X2 and the new Mercedes-Benz GLA. This entry was posted on Monday, April 15th, 2019 at and is filed under Audi, Auto Shows, Automakers, Automobiles, Business, Crossovers/CUVs, Events, Luxury Vehicles, Markets, New York, SUVs, Sales, Sales, Technology, Trends, U.S./North America. You can follow any responses to this entry through the RSS 2.0 feed. You can leave a response, or trackback from your own site.